The monumentality and deep carving of this piece make it one of the finest examples of the ornate style that developed during the Hoysala Dynasty (early 12th to mid-14th century). Krishna spent his early life fluting in the bucolic groves at Brindavan while tending to the animals and the young ladies. Adorned with gems and jewels, he is accompanied by his wives, other musicians, and admiring sages. According to legend, the infant Krishna was saved from imminent death when his parents exchanged him with the newborn offspring of a herdsman. With his foster parents, he had a happy childhood, playing mischievous boyish pranks and seducing rustic maidens, who found his flute playing irresistible. The heroic Krishna defeated many dragons and monsters as he grew in strength and beauty in the idyllic forests of Brindavan. Krishna is depicted as divine in the Mahabharata, one of the great epic books of Hindu culture written from about 400 BC to 600 AD. In the most famous part, the Bhagavad-Gita, he delivers his celebrated oration on duty and life to the troubled warrior-hero Arjuna, for whom he was a charioteer, on the eve of a decisive battle with evil forces. His exposition dramatizes the Hindu idea that one must perform one’s sacred duty—even heroically confronting death—in order to transcend the limits of worldly existence. The moral crisis central in the Bhagavad-Gita has inspired centuries of Indian philosophy, and also such Western thinkers as Henry David Thoreau, Ralph Waldo Emerson and T. S. Eliot. 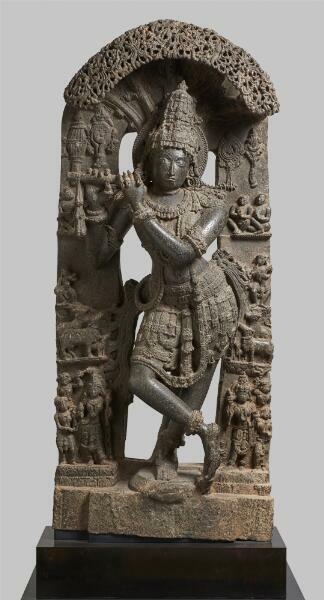 This graceful figure portrays Krishna, a vastly popular divine hero of Hindu legend. He’s poised in his characteristic pose, with his legs crossed at the ankles and left hip thrust out. The position represents benevolent tranquility and relaxation. As he often is, Krishna is shown playing his flute. Part of the instrument is broken off, but you can see the indentation on his chin where it once rested. Beside Krishna’s head are four attributes—on the left, the wheel and the lotus, and on the right, the club and conch. These confirm his identification with Vishnu. Krishna is the eighth incarnation of this Hindu preserver god, who came to earth in human form to restore order in troubled times. Little vignettes surround Krishna. At his shoulders are four seated ascetics beholding this cosmic manifestation. Below are cowherd musicians and cows. Lower still, we see a consort on either side, each with two female attendants. All have flocked to listen and submit to the enchantment of Krishna’s flute. It’s said that his blissful music captured the hearts of young girls and called devotees to divine life-deeds. Above Krishna’s head is a canopy of intertwining leafy and flowering branches, cut through to create a lacy trellis-like design. This highly decorative foliage represents the legendary wish-fulfilling tree of life, located in the bucolic groves of the region called Brindavan, where Krishna spent his youth. Originally this sculpture was placed in a shrine against a wall. But look at the back of the piece. A master sculptor beautifully modeled this part of the figure and skillfully carved the sinuous tree trunk. He made this piece around the mid-12th century, when this exuberant style was at its peak in the kingdom of Karnataka, in southwest India.